Chicago Cubs Salvino Bamm Beano"s Sammy Sosa #21 1998 Red with Tags. Official NFL Release Joe Namath Bear Collectible! "Joe Namath #12 Super Bowl Series". QB Club Bear. 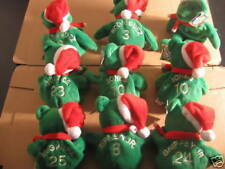 Bear is green and white plush with a gold embroidered 12 on the front with the Jets logo. The back of the bear has Namath and the number 12 in gold embroiderery. Hall of Famer wade boggs Beanie Salvino's Baby Bammers 1999 Baseball. Measures approx 6” tall. Condition is Used. Shipped with USPS First Class Package. boston Red Sox, Tampa bay devil rays Great condition! Tag has a crease but is still intact! Oakland Athletics A’s Jose Canseco Beanie Salvino's Baby Bammers 1999 Baseball. Measures approx 6” tall. Condition is Used. Shipped with USPS First Class Package. Great condition! Tag has a crease but is still intact! 2 Bamm Beanos Baseball Beanie Bears. Mark McGwire #25. Chipper Jones #10. Lot of 5 sosa, wood, elway, manning, davis salvino's bammers bears. The bears are in excellent condition the plastic boxes have scuffs, scratches signs of wear. Please ask any questions and thank you for looking. Up for auction is this 1999 Brett Hull #16 Savino's Dallas Stars Bammers Beanie Bear. It's in excellent condition and comes with a plastic display case. He also has his original hockey puck tag. This is from my personal collection so I can assure you that it was well taken care if and comes from a smoke free home. If you have any questions about this auction please do not hesitate to ask. Additional pictures are always available upon request. As always I combine multiple auction wins to save you shipping $$$ Make sure you check out my other auctions!!! Chicago Cubs Sammy Sosa Team Beano bear. Cubs classic pinstripes. This is a red Teddy Bear from Salvino's Bamm Beanos collection from 1998. This bear honors Sammy Sosa of the Chicago Cubs. This is a purple Teddy Bear from the Salvino Bamm Beano Collection honoring Mark McGwire of the St Louis Cardinals. Nomar Garciaparra Bear. This beanie plush toy is in great condition with no tears or marks on it. Beanie Plush. BEARS ARE:KEN GRIFFEY JR ANDMIKE PIAZZA. 1 Sammy Sosa Bear. 1 Cal Ripken jr Bear. 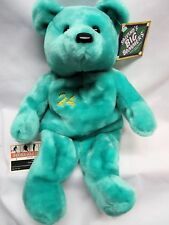 Green Mark McGwire Christmas beanie bear from Salvino's Bamm Beano's, December 1998. Salvino's Bamm Beanos Plush Beanbag Bears. Each bear is about 9" tall and weighs about 5 ounces. FOR YOUR CONSIDERATION: AN ULTRA RARE YEAR 2000 PLANET PLUSH BEANIE ELECTION TRIO which have MATCHING LIMITED EDITION NUMBERING (1424/2000), consisting of the Donkey, the Bear and Elephant with matching numbers sewn on. JOHN ELWAY #7 DENVER BRONCOS, NFL. 1- NEW LIMITED TREASURES RARE 98 TEST ISSUE BEAR #12,882 of 15,000. Bear only. New kept in plastic display case. SALVINO'S BAMM BEANOS. CONTENTS: McGwire (1), Sosa (1), Maris (1), Ruth (1). BASEBALL LEGENDS! Great collectible for sports collectors, Mark McGwire fans and collectors, Oakland A's collectors, baseball history collectors, or Salvino stuffed animal collectors. Bear is about 9.5" tall and about 5.5" wide at the widest part (arms) side-to-side. For sale are these 3 collectible Bamm Beano McGwire bean bag bears. One bear is Black H.R. Champ and the other 2 are purple. No wonder he’s the Dominican Republic’s favorite son! I hope you enjoy it as much as we did. 1999 CLEVELAND BROWNS Salvino's Bammers Stadium Beano Bear (NWT - 8/13/1999) !!! The inside of the attached take lists that information. These were a Stadium Exclusive collectible. 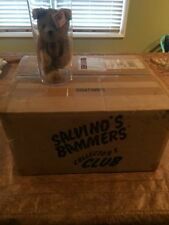 Salvino's Bamm Beanos 1998 Full Set MLB Beanie Babies Bears Plush Condition is New unused. Players include Ripken, Griffey, Tino Martinez, Clemens, Ivan Rodriguez,Bonds, Sosa, Justice, McGwire, ARod, chipper Jones and Jim Edmonds. the full set of 12 is here from the 1998 season. Thanks for looking, we ship quickly and for free with USPS. 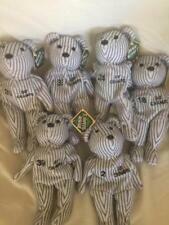 Team Beans Authentic Pigskin Brett Favre Teddy Bear Green Bay Packers. In excellent condition w/tags, no tears or stains. (See pics). PayPal preferred. Salvino's Bamm Beanos Plush Beanbag Bears. Lot includes #25 Mark McGuire and #21 Sammy Sosa. All the ones shown in the pictures are included in the lot. For your consideration are these EIGHT pre-owned Vintage 1999 NHL Collectible Bears including Federov, Yzerman & Roy as follows: Pre-owned ’99 NHL licensed collectibles Includes Eric Lindros (88, Philadelphia Flyers), Steve Yzerman (19, Detroit Red Wings), Patrick Roy (33, Colorado Avalanche), Jaromir Jagr (68, Pittsburgh Penguins), Sergei Federov (91, Detroit Red Wings), Mark Messier (11, Vancouver Canucks), Wayne Gretzky (99, New York Rangers), Dominik (39, Buffalo Sabers) Hang tags attached Each bear comes encased in a see-thru hard plastic container Three empty containers are included Beanies are in excellent condition from being stored in the hard plastic containers. The plastic containers show significant scuffing.